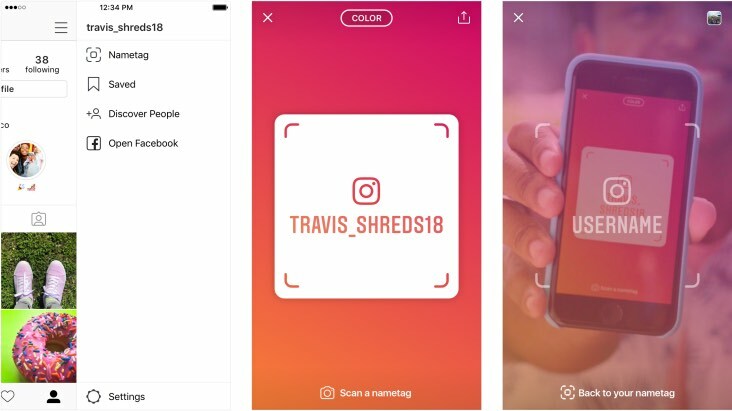 Instagram today debuted a new feature called "Nametag," which is a customizable identification card that's designed to allow people to easily find your Instagram profile when it's scanned. The Nametag feature makes it simpler for people who you meet in real life to follow you on Instagram. You can set up your Nametag by going to your profile, tapping the hamburger button at the top, and selecting the "Nametag" option. Nametags can be personalized with various colors, emojis, selfies, and stickers. Scanning a Nametag is done within the Instagram app through swiping right into the camera or tapping on the camera and choosing the "Scan a Nametag" option. Nametags can also be shared in text messages and on other social media sites. In addition to Nametags, Instagram is also launching a new School Communities test feature. School Communities is designed to let you connect with other students or recent grades from your university. Connecting to other users is done in a "common space" at several test universities across the United States. Those who are at a test site and choose to join can add a line to their profile listing university, class year, and relevant groups. Everyone who is participating in the Communities feature can see a directory listing of all of the people who have added the same university. The new Nametag feature is rolling out to iOS users starting today. School Communities are in "some US universities" and will be expanded to additional universities in the coming weeks. Instagram might as well be Snapchat now. They've been CRUSHING Snapchat for over a year. Snapchat is in their tail lights about to disappear at this point. It has been Snapchat for months. It's much better IMO, Snapchat's days are over.